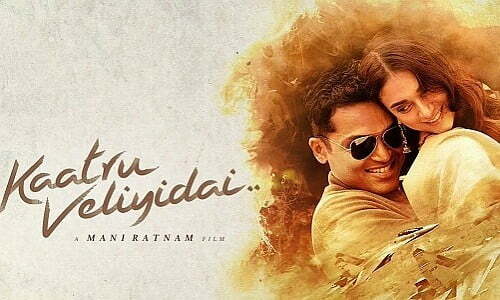 Kaatru Veliyidai (English: Amidst the air) is a 2017 Indian Tamil-language romance film produced, written and directed by Mani Ratnam. Made under the Madras Talkies banner, it features music composed by A. R. Rahman, cinematography by Ravi Varman and editing by A. Sreekar Prasad. The film stars Karthi and Aditi Rao Hydari in the lead roles with Lalitha, Rukmini Vijayakumar, Delhi Ganesh and RJ Balaji playing other pivotal roles. Set in the backdrop of the Kargil War of 1999, the film narrates the story of an Indian military pilot who recalls his romance with a doctor in the lead up to the war, while being kept as a prisoner of war at a jail in Rawalpindi, Pakistan. Principal photography of the film commenced in July 2016, with the shoot taking place in Ooty, Hyderabad, Ladakh, Chennai and Belgrade, before being completed in January 2017. The film, along with a dubbed Telugu and Hindi version titled Cheliyaa and Gagan, was released worldwide on 7 April 2017.